The TFV4 sub-ohm tank from SMOK hit the racks in 2015 and has been hailed as a genuinely premium vaping product. Look at our intensive review of the Smok TFV4 Sub Ohm Tank below to learn all about it. The TFV4 (Taste Furious, V4) is the latest release from the popular company SMOK. A sub-ohm tank, it comes with a range of coils and an outstanding RBA section, and neat features such as a cooling dip trip and a top fill function. The TFV4 sub-ohm tank can hold up to 5ml of juice for vaping and is priced at $49.99. Interesting as this sub-ohm tank sounds, below is an in-depth look at what it can do. The TFV4 sub-ohm tank makes filling the tank easy, thanks to its top fill design which is accessed via the sliding top. For those who are very precise with their vaping temperature and prefer a cooler vape, the drip tip is double layered with airflow control. The coils provided are with organic cotton made in Japan, which reportedly provides a smoother and richer vape. All the TFV4 coils available are compatible with this tank. Packet complete with RBA accessories, Japanese cotton wick, and a pre-made pre-coil. For the price, you do get a lot, and all in one sleek, awesomely-designed tank kit. By the looks of its contents, we’re sure to see some huge, thick clouds with the TFV4! Now for the most exciting part: trying out the three coils that’s included in the kit. We’ve broken it down for you and tested different ranges for your sake (and ours , too). This is the pre-installed coil, so it’s the one we started off with. The manual says that this coil works between 40-130 W, so we used it at the minimum, 40W. Flavor wasn’t that impressive, but cloud production was off to a good start. We increased the power to 50 W, and at this level the flavor was clearly more pronounced and the clouds are improved. We didn’t think it there would be much of a difference at 60-70 W, so we went straight to 80 W. At this level we really got the best combination of cloud production and warm flavor without any dryness. According to SMOK, the 0.15-ohm TF-Q4 quad coil can be used anywhere between 40-140 W. Again we started out with 40 W. Unsurprisingly, there was nothing special about the 40 W experience; the flavor and clouds were low-key. We then jumped up to 80 W and got a warmer vape with awesome clouds and explosive flavor! We then amped it to 100 W and clouds were chugging out, with no change in flavor. The vape was a bit warm, but not hot. We tried 140 W and if you’re really into huge, thick clouds you’re going to love how TFV4 performs at this range. The clouds were pretty amazing and get thicker after every hit but, as expected, it got a bit hot even with the airflow slits were wide open. Our juice ran out pretty fast, and we had to refill the tank five times. If you love building your own coil, you’ll dig the TF-R1 RBA deck that’s included in the kit. We used the pre-made coil (also included in the kit) with a resistance of 0.85-ohm. We had the coil primed by soaking the wick with juice. We also filled the tank and left it there for a few minutes before cranking it up to 20 W. It was fairly normal vaping, nothing amazing, so we went straight to 30 W to see how it would do. Unfortunately, at this level the vaping was not an enjoyable experience, and we got mostly dry hits. We decided to lower the power to 25 W, which we thought was the best setting. At this wattage, the flavor and cloud production were ok, but not completely amazing. This tank is a giant, with 24.5 mm width and 73.5 mm height. The good news is that it has the capacity to hold 5 ml of liquid; but on the other hand, a lot of mods are probably going to just hang, except for the SMOK X Cube 2 160 W temperature control mod, which was designed to work with this tank. The design and structure of the SMOK TFV4 is stunning. Everything is made of stainless steel except for the glass tube. There are a total of 8 adjustable airflow slots – four each on the drip tip and on the base. The innovative design also features a top-fill design that is leak-proof, a variety of disposable coils , and an RBA deck. According to SMOK, the TFV4 sub-ohm tank kit will be the last tank you will ever need to purchase and, seeing as how customizable it is, they may just be right. The SMOK TFV4 sub-ohm tank has great features such as a top fill and a unique drip tip, and is overall durable and well-built. The coils provided are excellent and will cater to all your vaping requirements, SMOK has six other coils that will also work. The RBA section makes this tank a great alternate to the RTA, and is one of the best we have seen on a sub-ohm tank till now. The only drawback is the price, which is high enough to be prohibitive to some buyers. But rest assured that if you do decide to go for the SMOK TFV4 kit, you will be investing in a one-of-a-kind product. 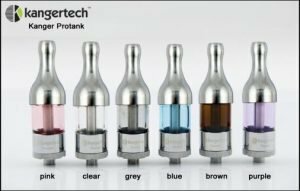 Kanger Protank is one of the cheapest vape tanks this company offer. But would it appeal buyers? Read our review and find out.